Carson Tahoe Health systems have been assessed by Sword & Shield Enterprise Security and has achieved compliant status under Sword & Shield's HIPAA Compliance Program (HCP). 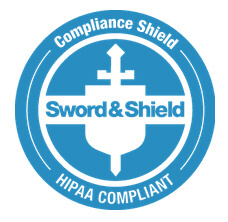 The HCP compliant status assures that at the time the compliance shield was issued, Sword & Shield attests that Carson Tahoe Health has implemented the necessary security measures to safeguard protected health information (PHI) and electronic protected health information (ePHI) as required by the Health Insurance Portability and Accountability Act of 1996 (HIPAA) and the Health Information Technology for Economic and Clinical Health (HITECH) Act. In accordance with the American Recovery and Reinvestment Act (ARRA) 42 CFR Part 495 and 45 CFR Part 170, Carson Tahoe Health is able, upon request, to provide your Health Record in either paper or electronic format. Your MEDICAL RECORD is considered the legal record which contains your protected health information for services rendered by Carson Tahoe Health and is gathered from all sources within our organization. Your HEALTH RECORD is a term defined by the Federally Mandated ARRA and is designed to meet the requirements of meaningful use. Your Health Record is LIMITED to your diagnostic test results, problem list, medication list, medication allergies, discharge summary and procedures performed.